The T Confidence Interval Function is categorized under Statistical functionsFunctionsList of the most important Excel functions for financial analysts. This cheat sheet covers 100s of functions that are critical to know as an Excel analyst. The function calculates the confidence value that can be used to construct the confidence interval for a population mean for a supplied probability and sample size. It is often used in determining the t value for 95 confidence interval. As a financial analystFinancial Analyst Job DescriptionSee a real Financial Analyst Job Description including all the skills, experience, and education required to be the successful candidate for the job. Perform financial forecasting, reporting, and operational metrics tracking, analyze financial data, create financial models, the CONFIDENCE.T function is useful in predicting the value-at-risk for a given portfolio. Standard_dev (required argument) – It is the population standard deviation for the data range. It is assumed that we know it. 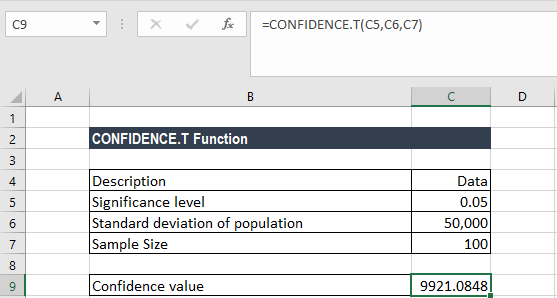 How to use T Confidence Interval in Excel? The CONFIDENCE.T function is used to calculate the confidence interval with a significance of 0.05 (i.e. a confidence level of 95%). Therefore, the confidence interval is 200,000 ± 9921.0848, which is equal to the range 190,078.9152 and 209,921.0852. #DIV/0! error – Occurs when the size argument is equal to 1.